Remember the day…..7th October 2013…why you ask? 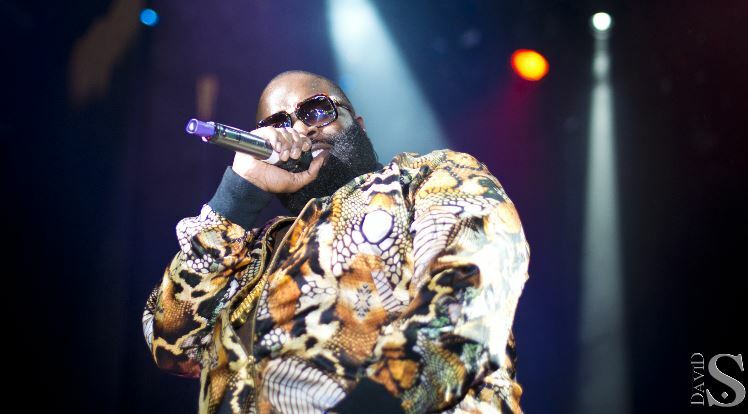 Because this marks the date that Rick Ross shut down the indigo2 arena….PERIOD! Since releasing the long awaited Self Made 3 album, Ross has been actively touring Europe with shopping bags in tow promoting the latest compilation from the MMG camp. To get the party started UK trapper Young Don kicked off the night with his latest tracks taken from his “Weatherman 2″ mixtape which features artists such as Ace Hood, Gucci Mane, Bobby Valentino and hosted by DJ Khaled to a mixed crowd reaction anxiously anticipating Rozay’s appearance on stage. As expected the Miami native hit the ground running with an array of bangers taken from his previous bodies of work warming up the crowd with classics such as “John”, “Hustlin'” and “Hold Me Back”. Accompanied by Whole Slab and BBC 1xtra’s DJ Semtex, the Bawse had the crowd jumping from start to finish like a kangaroo on a pogo stick with the ladies in the building hardly being able to contain themselves. To top it off not only did he reveal his top secret surprise for 9th October which he later revealed via twitter to be the date of his 6th studio album called “Mastermind” (out 17th December) but he also brought out none other than man of the moment 2 chainz to perform his current single “Fedz Watching”. Much to the surprise and admiration of the audience. All in all this experience was one not to forget with Rozay further cementing his dominance in the rap game for 2013 and beyond.